Date seal: 1865, 4th mo. Sawamura Tanosuke III is wearing a robe patterned with chidori (plovers) flying over a river. This motif appears in a number of prints in the Lyon Collection. One is by Utamaro, one by Kunisada and two copies of a triptych by Kuniyoshi. See the links attached above. 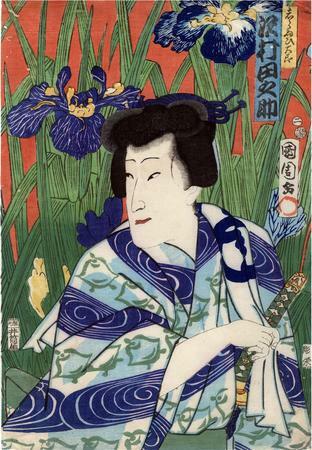 Another motif which should be noted is the large irises which fill the background. The iris is closely related to the Boy's Festival which was held at the fifth day of the fifth month. The flowers were included in the boys' baths and the leaves were used as toy swords. There are other copies of this print in the Ishibi Prefectural Museum and in the Nationaal Museum van Wereldculturen, Leiden. There are eight prints from this set in the Museum of Fine Arts, Boston.